Great cards. Would you believe I still don’t have that DSP but NEED to get some after seeing all the great examples. Oooo and I have almost all those items including the Cameo Coral ink so I might just have to get off my tail and make some of these – thanks for the idea. What delightful cards – thank you for sharing! Love how you have used the whimsical words stamps, my fav. 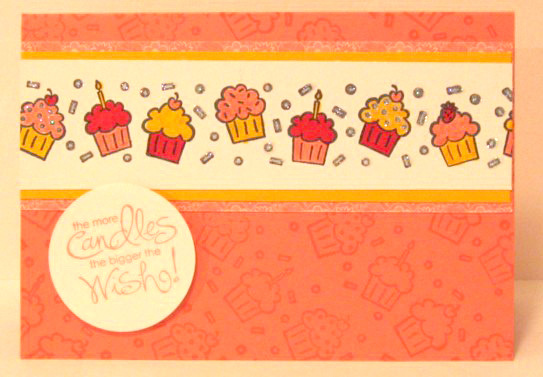 card is the cupcakes delish enough to eat!! Rebecca, really like the cke card, nice colours. beautiful cards and great workmanship! These are great cards especially for children. Love your top card. CUTE!! These are great! Thanks for the ideas. I love the top one the best – I just love the colours (and the stamp!!). Great cards, I really love that whimsical words set! Great cards Rebecca – think I might have to invest in this stamp set! I have been sold on this hop on the Whimsical Words set. You’ve done a lovely job here! Thanks for sharing your lovely designs. Don’t you just love these new SAB stamp sets? So bright and breezy Rebecca. The cake card is FAB and may be a case. Love what you have done with this set. U can never have too many sentiments. Love the simplicity – so nice! Loved the cards and I love that stamp set. lovely!! i love a bit of sparkle!!! These are great cards, thanks! what great use of these word stamps. I need to use the cupcake wheel as it hasnt seen ink yet. might have a case coming on. Love these cards! Would be great at a workshop. Love both cards! SO cute! ooh love that pink passion card..just lovely!